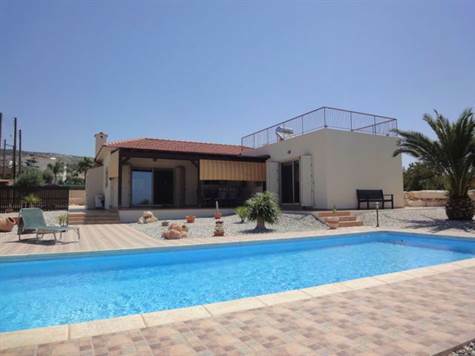 Sea Caves, Paphos - This immaculately presented 3 bedroom, 3 bathroom detached bungalow with title deeds is situated in the fabulous location of Sea Caves in a quiet residential cul-de-sac. The property has been custom built to an exceptionally high standard including cavity wall/roof insulation, damp proof course and high quality finishes throughout. The accommodation features an open plan living room including a comfortable lounge with recessed fireplace, spacious dining area and well equipped corner kitchen with maple dressed kitchen units, granite worktops and breakfast bar. Patio doors lead from the dining area to a large covered terrace from where you can enjoy the stunning panoramic sea views and the breath-taking sunsets. A hallway leads to three spacious double bedrooms all with fitted wardrobes. The master and second bedroom have en-suite facilities and there is a shower room with utility cupboard accessed directly from the hallway. The plot is private with many areas to enjoy the wonderful outdoor life. The 10m x 4m swimming pool with roman steps and Syrian stone edging has a beautiful wide terrace surrounding and an added bonus is a 4.5m by 7.5m roof terrace, again with fantastic views. Much thought has gone into the detail of this property to create what is a truly impressive quality home. Please refer to MLS #: 1355 when inquiring.